Great rock'n'roll rarely translates properly to disc. The history of the genre is littered with literally thousands of acts that were blinding and transcendent on the bandstand, yet limp, ineffectual or misguided in the studio. And the opposite is just as true, though the art of the recording medium allows for a control and an innovation that usually isn't possible in a live context. When the two disciplines are matched, there is the potential for true greatness; yet for those involved, the realization of such may come only after years of frustrated disillusion with the initial outcome. 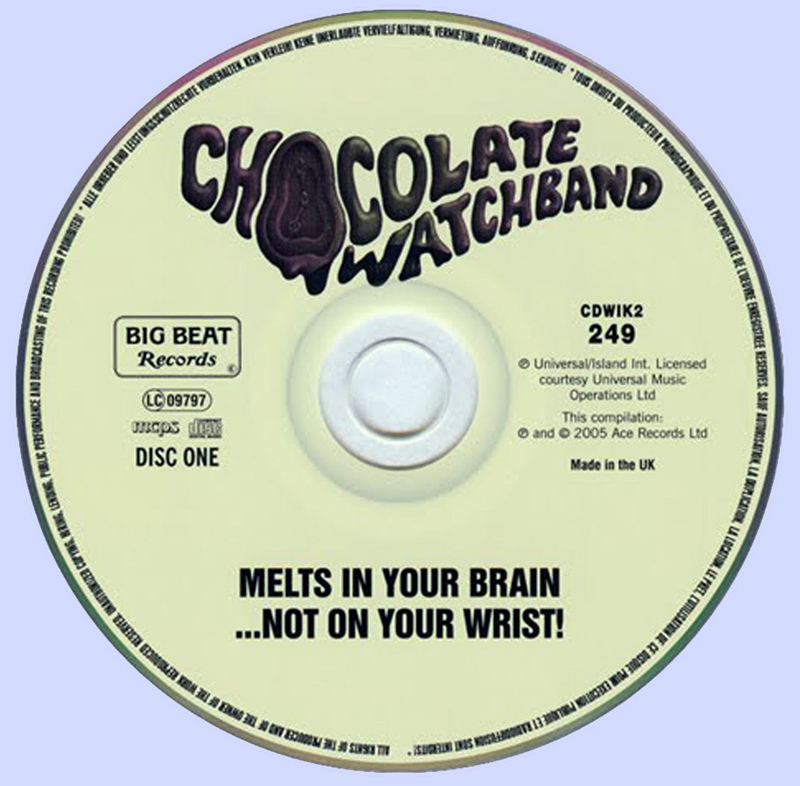 Such is the case with the Chocolate Watchband. The recorded legacy of this supreme psychedelic punk combo paints a picture quite removed from the truth, yet as our definitive new anthology MELTS IN YOUR BRAIN . . . NOT ON YOUR WRIST demonstrates, it nevertheless holds up as one of the finest catalogues of the 1960s, balanced between the Watchband's own Anglophile blueswailing, and a preternatural aura, the result of studio trickery imposed without the bands knowledge or consent. The juxtaposition acts as a paradigm of how the British Invasion-inspired punk fury acquired an experimental veneer, and led to something unique. 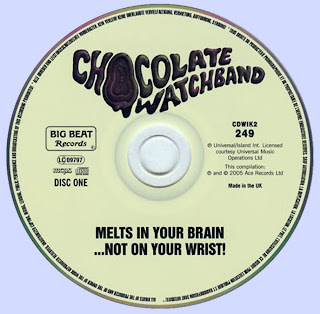 By unwittingly having their record career mapped out for them by producer Ed Cobb, the Watchband paradoxically wrote themselves into the annals of cultdom; yet it is the rock'n'roll heartbeat of this once-in-a-lifetime band that is their true heirloom. As well as handily collecting their complete recorded works 1965-69 in one nicely remastered package, Melts In Your Brain . . . Not On Your Wrist" seeks to finally clarify the peculiar and fascinating history of this consummate group. 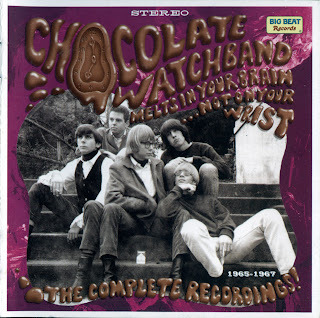 The tracklisting on this definitive 2 CD set clearly delineates between the tracks that truly feature the definitive Watchband ie the grinding 1966 model led by frontman par excellence David Aguilar - and everything else attributed to the Chocolate Watchband name, whether it be recordings by the earlier and later incarnations of the combo, or those trippy cuts on their three long-players either adulterated or recorded by someone else entirely. The many aficionados that have come to love the Watchband's albums over the years are no doubt blissfully unaware of the machinations behind the substitutions and studio fakery on their records, and no doubt cherish the non-Watchband sides on those records just as much. To which end, their studio adventures, as well as the illustrious life and times of the Watchband are examined in great detail in the copiously illustrated booklet, with commentary from all the bands members, and a rare interview with the late Ed Cobb. Awesome. Tremendous effort on the Chocolate Watchband. As always! I'm having trouble with these as well, except part 1. It just goes to an ad page instead of downloading file. Not sure if it is really a problem with your file, or if DepositFiles is just acting weird lately.